Facial oils have become all the rage in the skincare world. And with good reason. It doesn't matter what kind of skin type you have, you can use a facial oil. Even if you have oily skin. The oil on you skin (sebum) is different from the oil in these facial oils. These are botanical oils that come from plants. They are molecular-wise smaller than what is on our skin. The oils penetrate our skin deep enough to make a difference and sink right into the skin, hydrating it and giving it the moisture it needs so that your skin feels better. 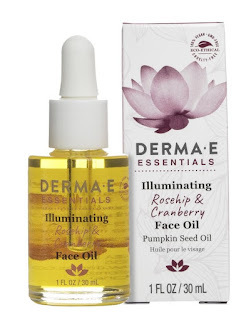 This particular facial oil called the DERMA E Essentials Illuminating Rosehip & Cranberry Facial Oil Pumpkin Seed Oil is a great oil for normal skin to dry skin. 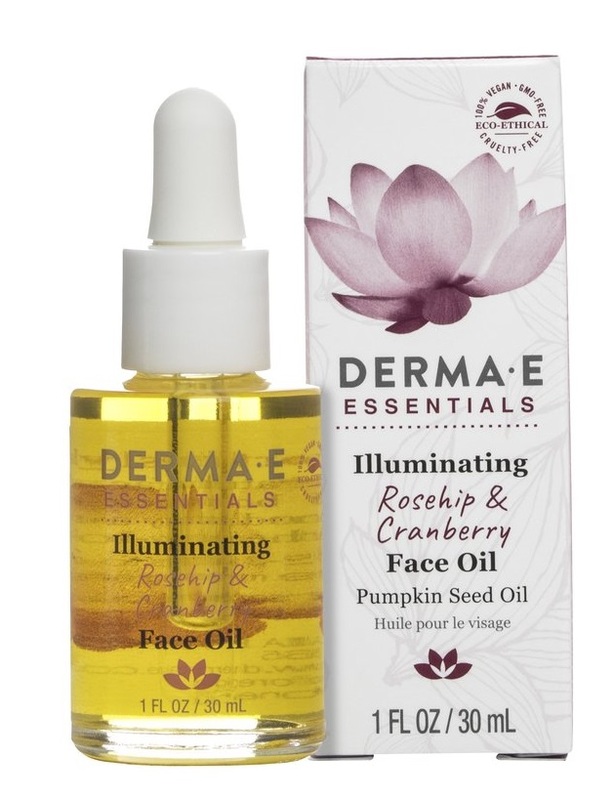 Applied after cleansing and toning, it sinks into skin and leaves it feeling hydrated, luminous, healthy-looking, brightened, and more youthful looking.This is due to the plant botanicals, the Rosehip Oil (which brightens), the Cranberry Oil and organic Pumpkin Seed Oils that provide a more youthful glow. Skin will look younger, feel younger and have an overall appearance of youth. Such as radiance, plump skin, little to no fine lines or wrinkles and very little pigmentation. To use, apply 2-3 drops to hands and then massage onto clean face in the morning and evening. In the morning, make sure to follow up with a SPF of 30 or more. Sunscreen is one of the main anti-aging ingredients that helps prevent fine lines and wrinkles as well as hyperpigmentation. In the evening follow with a moisturizing cream if needed. If not, use just the oil. I really, really like this facial oil because it sinks into my skin, leaving it feeling soft, supple, brightened and ready for makeup or ready for skincare. I like to use gadgets to help get the skincare into my skin as much as I could have been. They really help to get the skincare into the skin without wasting it. This oil is a great one because it does what is says it is gong to do. It does not make promises that it is not going to keep.